Welcome back to Day 2 of Marblehead Week of tutorials and giveaways! Use this clever piecing technique to make an autumn-hued runner for your table! Cut sixteen 5" squares from the white solid. 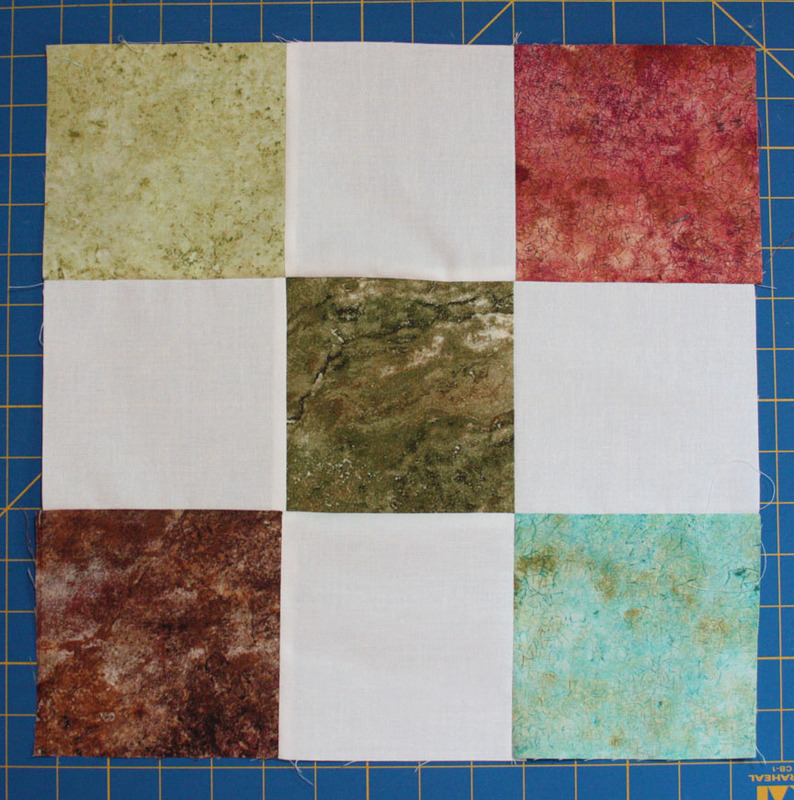 Lay out 5 colored squares and 4 white squares into a ninepatch as shown. 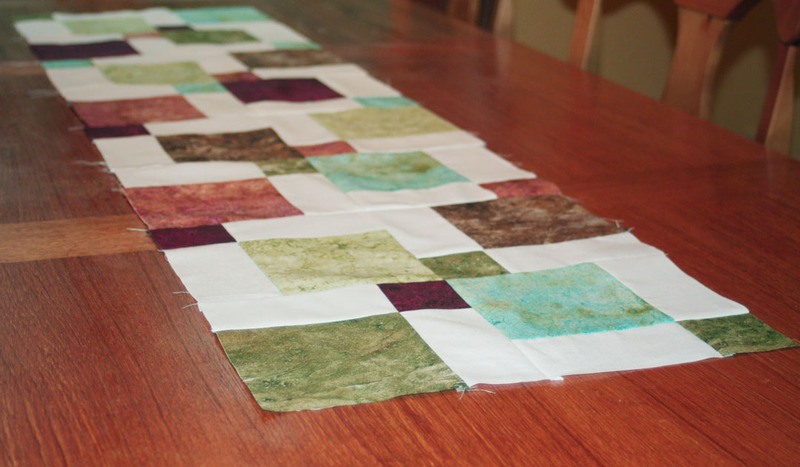 Sew the squares together into rows and join the rows. Cut the ninepatch in half in both directions to create 7" blocks. 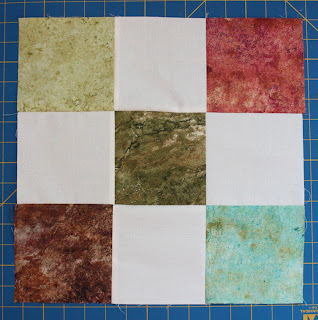 Make 3 more ninepatches and cut to create a total of 16 blocks. Now it's time to lay out the runner! 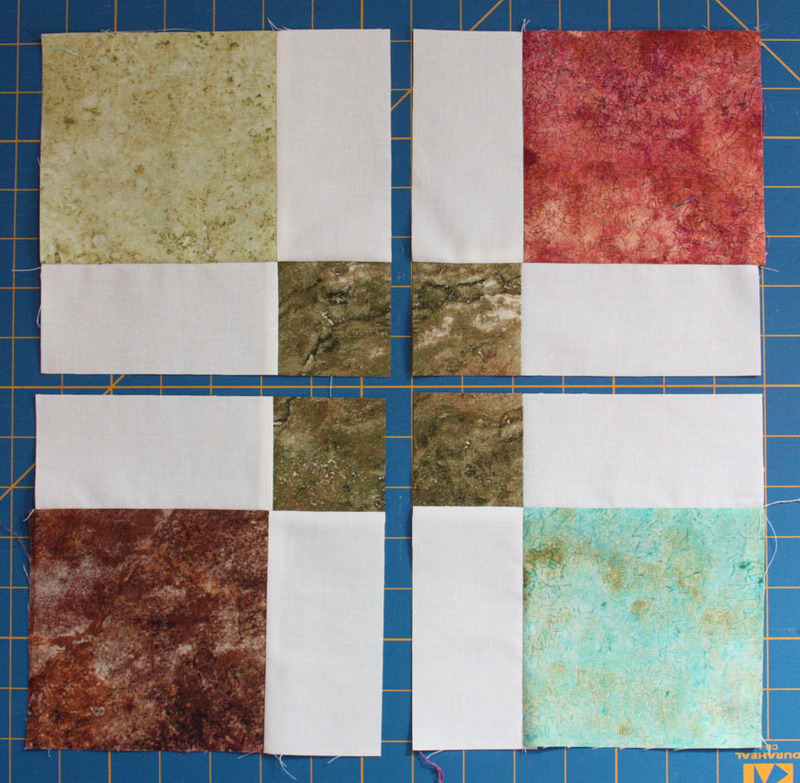 There are many different ways to lay out these disappearing ninepatch blocks. We'll show you a few options here, but you can experiment more on your own as well. Sew the blocks into rows and join the rows. Layer the backing right side down, batting, and runner right side up. Baste and quilt as desired. 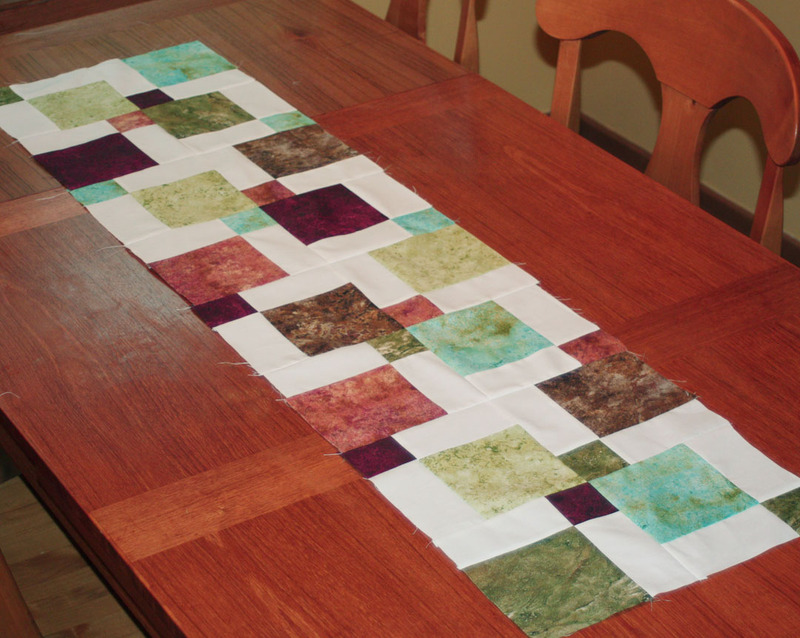 Use four 2-1/4" x 42" strips to bind the runner. Today we're giving away a fat quarter bundle of Marblehead prints! To enter to win, simply sign up to follow our blog using Bloglovin' or "follow by email" (both on the righthand sidebar) and then leave a comment below telling us what type of sewing project you're working on right now. The giveaway will be open through Friday, August 9th at 11:59 EST. In love with Marblehead? Click here to find out the details to enter our Marblehead Challenge. Make a project using Marblehead and enter it to win a great prize package, including 20 yards of fabric! Check out our other Marblehead Week tutorials! I love the disappearing none patch. It is one of the most versatile patterns out there. Not only is it a highly reusable pattern but it is user friendly for beginners. I love your fabrics and have missed them greatly since the store that carried them closed on our town and I know have to travel or order online. I love this idea. I've seen the disappearing 9-patch, but hadn't found a project to try it with. 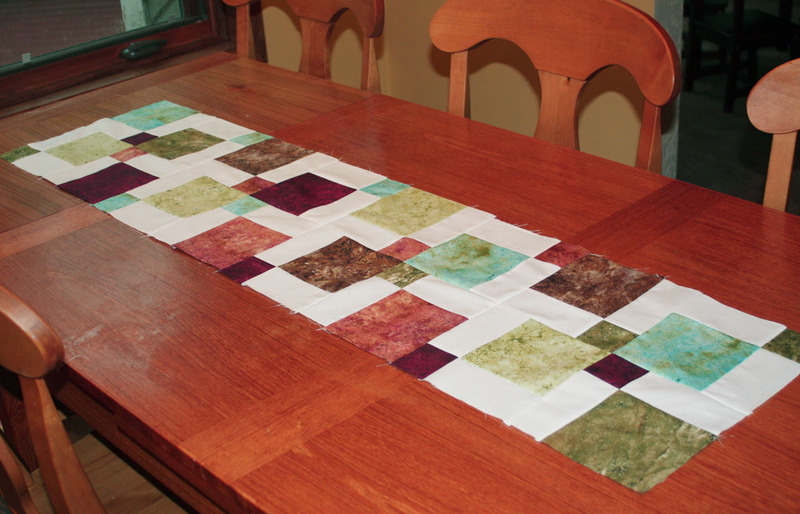 This table runner fits the bill!.. I'm working on some baby quilts for neighbors and charity. I follow you by RSS Feed & e-Mail. These Marblehead prints will make up some pretty projects. I like D9P - so versatile! At the moment I'm making a baby quilt for my niece who's expecting her first baby next month! I'm already following you via email. Thanks for the tutorial, and the chance to win! I'm working on my second baby quilt for my first grandchild due this November! I am actually making table runners right now. I will make a whole set -- most are holiday/seasonal so the recipient can change them throughout the year. I will give the collection as a Bridal Shower gift later this month. I already follow by GFC and email. I'm working on a quilted basket for my thread. Thanks so much for the giveaway and I am already a follower through GFC/Bloglovin. Right now I am cutting out pieces to make an applique baby quilt. I have been cutting charm squares to make table runners for Christmas. thank you for the tutorial. I may try this pattern. I love it!!! I am working on a lap quilt right now, but I want to do a disappearing nine patch soon!!!! I follow via Bloglovin. I'm actually quilting two different tossed 9 patch quilts!! One needs a little more border work, and the other needs quilting. It's a great way to use charm squares! Thanks. I follow you by email. I'm currently working on a blog hop project. Love the D9P and the beautiful fabric! I'm working on a Christmas throw and some BOM's. I'm currently working on baptism banners for church, and a quilt for a new great nephew, and a window valance. I seem to always have several products in the works. I follow by email and right now I am not working on anything. I am following via email. I am hand sewing down binding for my sisters tablerunner. I follow by email. Love the table runner! I already follow by e-mail. I am making hot wheel car totes for a craft sale on Saturday. The tablerunner is great! It really keeps one's eyes moving. I'm making some cosmetic bags right now. Thanks for the giveaway! I follow you by email. I have several projects going, right now I am trying to finish quilting a Christmas quilt for my daughter that was supposed to be finished last December . . . I have 5 WIP's at this instant: a couple of 22" hexagon wallhanging intended for my double door, a bed quilt using the MBS wigglywhimsy pattern, a T-shirt quilt graduation present for my niece, a long-term hexagon king-size bed quilt and lastly, sew the patches on my son's patriotic quilt top. I received them in the mail from my daughter-in-law because my son is currently deployed. And, I follow your blog by email. Thank you for the chance to win a bundle of marblehead prints. I already follow your blog by email! Right now I'm working on a bag with 3 baby quilts, a t-shirt quilt and a few more bags waiting in the wings! Then I'll start my Christmas sewing! I am working on a dress for my granddaughter , it is her birthday next week. Love the runner and I am a follower by email. Thanks for the chance . I am already following via Blogloving but hit the button anyway. May get it twice now? Really like that 9 patch deconstruction. I'm a follower via BlogLovin! I'm working on a Prism quilt in a queen-size for my dad, and for handwork, an EPP hexagon quilt in a color wheel. I follow via email and I like your table runner, so many layouts. I'm working on a blue work wallhanging and I'm finishing up a quilt for my granddaughters. Thanks for the tutorial and the giveaway. I follow with email. I'm doing the Happy Quilting Star Surround QAL, I'm working on the flying geese still! Thanks. Follow by email. I've got 3 projects running right now. I'm finishing up a Lucky Stars quilt, working on a jelly roll quilt & hand quilting a Steelers quilt. I'm making eyeglass cases. I cut out six today and will whip hem together tomorrow. Beautiful table runner. I do like the Disappearing Nine Patch and also the Disappearing 4 Patch a lot. These fabrics are such rich colors. So pretty. I'm glad you are going this challenge because I don't recall seeing this fabric before now. I am already a follower with BlogLovin' and also via email. I am not in the middle of any sewing project currently, however I do have a few that I need to work on very soon. I need to make a little purse for my oldest Granddaughter. Her birthday is the end of this month and she will be turning 6 years old. My future DIL is making her a little dress so I thought a purse to match the dress would be just perfect. After that I need to make a get started on placemats for gifts. I'm following you with Bloglovin. On my sewing table now is a miniature FPP in progress. Thanks for the giveaway! 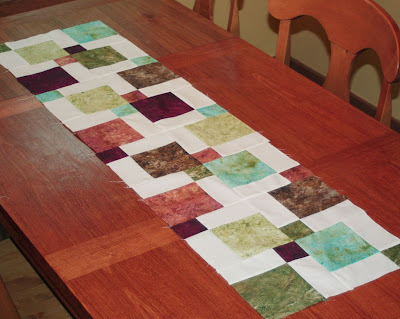 I already follow you via BlogLovin', and I just finished a D9P table runner using this tutorial! It's now on my daughter's dresser. Next up is a purse for me. I follow through the Blog. I am not working on any major sewing projects right now until I finish with the huge box of mending and two more boxes of half-hemmed dish towels. Then I plan on doing a few toddler dresses. I am making a dress for my daughter! I am working on a "healing hearts" quilt for a group I belong to. We make quilts and send them to people who are going through a rough time. I follow on Bloglovin. I'm working on a quilt for my husband. A friend helped me design it, and develop the block size, counts, fabric requirements etc. I am working on machine quilting a couple of quilts. I follow via bloglovin. I am a follower. I am currently making Christmas quilts to raise money for a prayer quilt ministry. Lots of fun!! Just bought fat quarters of bright Batiks & didn't have anything in mind until this tutorial! This time of year I like to make something that looks like a garden riot is taking place on my table! Faith.